As the co-founder of Facebook, the popular social networking site, Mark Zuckerberg is a rather enigmatic figure, rarely caught out in public these days, despite being the youngest billionaire in the world. "The Social Network" looks to map out Zuckerberg's rise from zombified programmer to online dynamo, yet lacks the participation of the man behind the keyboard, preferring to pilfer the pages of the 2009 book, "The Accidental Billionaires," to construct a suitable portrait. Perhaps this is why the film is so sharp and rapid-fire, forgoing the need to appease egos, instead stomping around acres of mud, portraying the young internet wizard as a ruthless, friendless, untrustworthy punk inside a barbed wonderland of litigation and dot-com startup euphoria. After his blunt, near robotic personality lands him in trouble with his semi-girlfriend (Rooney Mara), Mark Zuckerberg (Jesse Eisenberg) strikes back with a particularly inventive evening of coding, resulting in a website sensation that humiliates most of the ladies on the Harvard campus. Attracting the attention of upperclassmen Divya Narendra (Max Minghella) and twins Cameron and Tyler Winklevoss (Armie Hammer), Mark is handed the task of creating a social interaction site for his school. Instead, the inspiration moves him to create "The Facebook," a limited, but novel site, funded by Mark's only friend, Eduardo Saverin (Andrew Garfield). Exploding in popularity, Mark desires to keep the site's cache of cool in check, while Eduardo hopes to expand into advertising. Sensing an opening in the relationship, former Napster founder, Sean Parker (Justin Timberlake), swoops in to take command of Facebook, playing to Mark's lust for power as lawsuits explode, with the young CEO facing fire from all sides as everyone comes to claim credit and cash. To have director David Fincher and screenwriter Aaron Sorkin collaborate to bring this story to the screen is akin to a superhero team-up, with two major forces of artistic might putting the sort of care into a project few would expect much out of. It's an exemplary polish to a sketchy tale of deception, arrogance, and backstabbing, endeavoring to breathe life into an unfinished saga, released during a delicate time when Facebook is enjoying unparalleled success, with Zuckerberg struggling to twist his reputation as a brilliant twerp into a Bill Gates brand of legitimacy. It's clear from the first few minutes that "Social Network" is a Sorkin creation, submitting a Tommy Gun-style of writing that twists the banality of Facebook's formative years into a cracking, lacerating verbal assault. Blending stark characterizations with a toxic back and forth between Mark and his accusers, Sorkin takes the legal and social particulars to an intriguing level of suspense, held together by superlative dialogue that lends the story a theatricality to keep it awake. Tinkering with structure, using Mark's legal woes as the spine of the story, Sorkin dances through time to underline the origins of the site, the paranoia of the participants, and the lust for money once Facebook hit the big time. It's a story of sharks feeding on sharks, with bystanders watching helplessly as Mark rides his online prowess to the big time, resulting in vicious accusations, unbridled jealousy, and a string of deception that's chronicled masterfully by Sorkin's tart, taught writing. In perhaps his most subdued directorial offering, Fincher winds around the story efficiently, evoking a grand collegiate environment, helping Sorkin effectively arrange his chess pieces. The director doesn't have to do much to isolate the toxicity of the conflict, but Fincher gives "The Social Network" its wondrous presentation, sticking to immaculate compositional and aural habits, allowing his cast to lead the charge. A few sequences are ruined by unnecessary visual showmanship (a rowing encounter in England has Fincher employing tilt-shift photography for reasons unknown), but the majority of the film keeps tight to mood and anxiety, refusing to compete with the head-slapping turns of fate, allowing Mark's vile behavior to be the special effect. Embodying a burgeoning Gen Y brand of evil, Eisenberg delivers career-best work as Mark, shutting down his acting tics to portray a robot of a man -- a savant type who failed at interpersonal relationships, taking refuge in his vast computer skills, blogging and coding his way to greatness. Fueled by jealousy, Mark is portrayed here as a callous, vengeful ghoul, quick to turn his back on his supporters as he loses himself inside the kingdom of his mind. Eisenberg, traditionally drawn to noodle-bodied, geeky roles, shows mighty presence in the picture, delivering a steely performance that keeps Mark an oddly sympathetic villain, showing the frustration of his genius while gamely articulating his repellent, perpetually disrespectful personality. Eisneberg and Garfield (who's nicely panicked and defeated, but hardly resembles someone from Brazil) make a captivating pair of leads, lending the film something of an emotional pull while the rest snuggles up to frosty procedural antics. The only true weak spot in the ensemble is Timberlake, wildly overplaying his hand as Parker, a man who wormed his way into Facebook using his innate charm, dividing Mark and Eduardo. The singer looks the part, but his schmooze is painfully artificial, failing to color the character's reptilian entrepreneurial pathology to a satisfying extent. 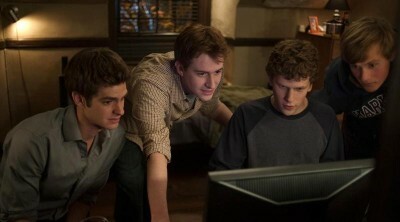 Ultimately, "The Social Network" isn't a fully rounded picture, never allowing Mark the humanity he deserves; instead, it's a blade of a movie, cutting around this peculiar battle for ownership with outstanding aim, sitting down with arrogant, brusque men as they battle for control of Facebook. It's not an easy time with this pompous crowd, but the feature encourages the venom to a mesmerizing level of engagement, turning legal woes and verbal abuse into a spellbinding sit.